When you want to be more independent from society, it can also mean taking more steps to change the way you live at home. 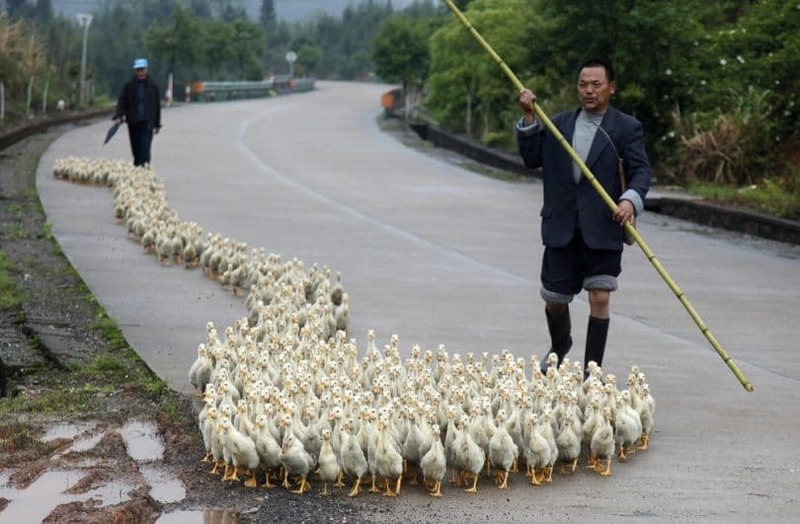 People have learned to grow their own gardens so that they have their own source of food, but nothing is more rewarding than raising your own flock of ducks. Many people think that the task alone is difficult and that the rewards don’t outweigh the means, but it’s a lot easier than you think. 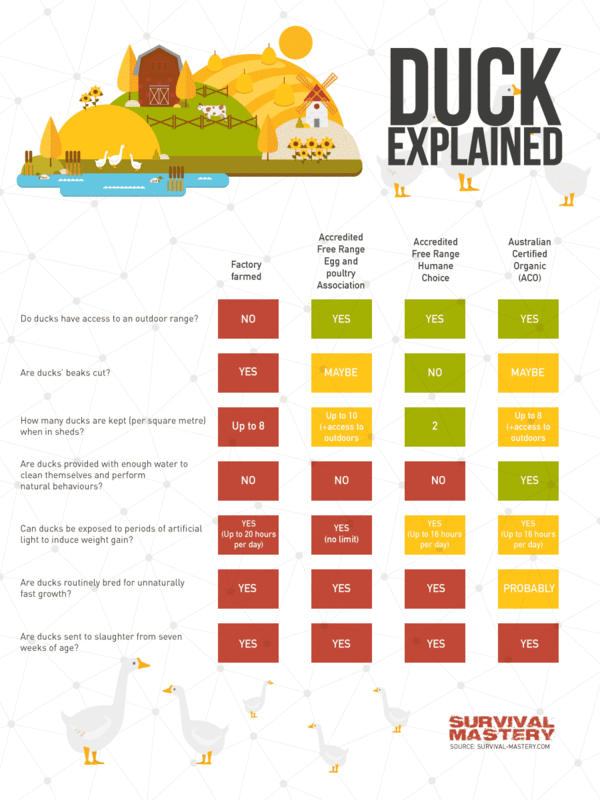 Here’s a guide on how to raise ducks and the benefits the process can bring to your life. If you’re going to be rearing ducks, you have to actually care about them. If you’re not fond of the animals, then it’s unlikely that you’re going to enjoy having them around, as they do require your attention throughout the day in order to thrive. Ducks can be an excellent source of food, as both meat and a source of eggs on a daily basis. They do require very little care and are practically free from many disease and problems. You don’t have to worry about feeding them very much either, as they can still gain weight very quickly even when they’re left to forage for their own food. you can buy ducks eggs and let them hatch. 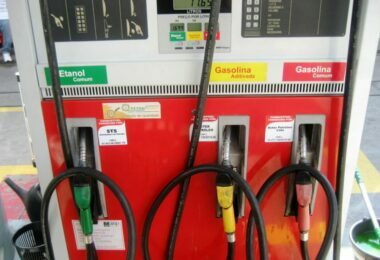 Each process requires different amounts of attention, so you can try a combination of them to see which one works best for you. In order to maintain your population of ducks easily, keeping breeder ducks will ensure that you always have a steady supply of animals. Before you know how to raise ducks, you should do some research into finding a local farmer or breeder that can supply you with breeder ducks beforehand. It definitely helps to have a stream or pond if you plan on keeping breeder ducks. If you don’t have a foraging area for your ducks, you can always keep them fenced in. They don’t seem to mind the lack of free range, but you will have to feed them more often, and if you don’t have a pond, you can fill a trough with some water for them to wade and swim around in. They’ll survive without a pond, but ducks so like to keep themselves clean and this will promote their good health and overall happiness. It’s also a lot easier for the ducks to lay eggs, as they will use their moist feathers to keep the eggs wet when they lay on them. If you’re looking for the right kind of shelter, then a small coop with a door would be best so that you can have an easier time gathering their eggs. All you’ll need is some bedding material like hay for them to keep warm and dry. You don’t have to worry about making any prefab nests for them to use; they’ll build them all on their own and will hatch at least twelve to fifteen ducklings twice a year. Ducks are also capable of producing eggs throughout the year, and are heaviest in the early spring until July. In order to maintain your population, you need to find a balance between how many eggs you’ll take for food so that the rest may hatch. The best male to female ratio is typically one drake for every five to six ducks, but this may be too much to handle for a first time duck rearer. It may be best for you to start off with one drake and two females, and then steadily increase your numbers over time so that it doesn’t become too much for you to handle. If you’re looking to eat your ducks, they’re at their prime age at about ten weeks. After this, the ducks will begin to moult and gain weight very slowly, no matter how much they eat. It’s up to you to decide when your ducks are big enough to be eaten and either maintain a few to use as breeders in the future or use them all as a food supply. Your original ducks will only last about two to three years, so it’s important that you always consider new breeders from your flock to replace them. 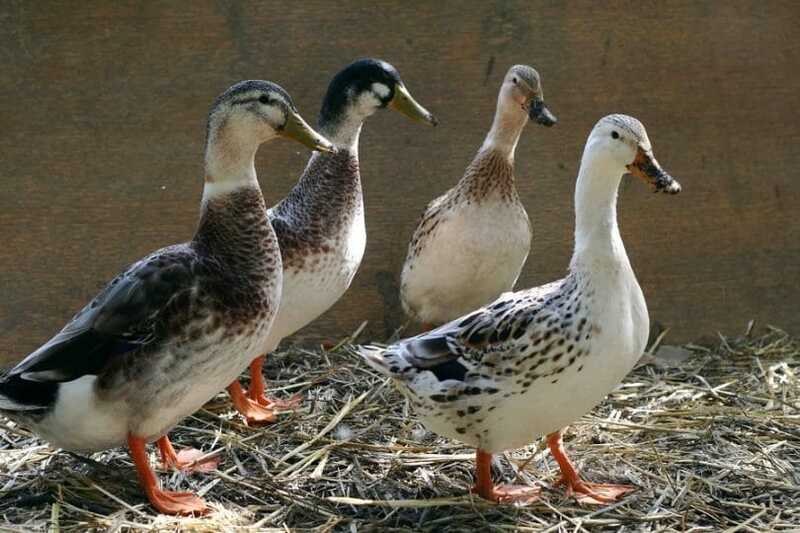 The three most suitable breeds of ducks for people to raise at home are the Pekin, the Muscovy, and the Indian Runner. You may want to select which breed of duck you want, depending on your needs. The Muscovy is the largest of ducks and will provide a lot of meat, while the Pekin is the second largest. On the other hand, the Indian Runner lays the most eggs out of the three but it doesn’t “sit” eggs very well and will require further incubation if you want them to hatch. This option may be easiest for those who are looking to save some money, as ducklings are very cheap to get. And who doesn’t want to carry home a box of adorable ducklings? The best way to get day-old ducks is through your feed dealer or from people who advertise their ducks on farm journals. The easiest times to get them are between April and July. A dozen baby ducklings are quite easy to keep and they will need some artificial heating for the first three weeks that you have them. These baby ducks will be ready for eating come mid-June and until the late fall, but you can eat duck all year round if you have a good freezer to keep them in. You’ll also want to consider keeping a few of the babies as breeders if you find that you enjoy keeping ducks and are interested in starting your own flock. 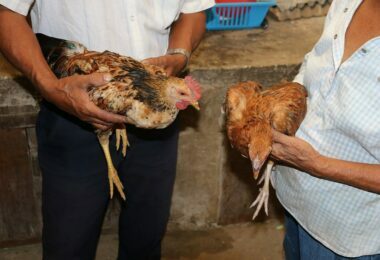 Many people who have ducks also keep chickens, and will use them to brood the duck eggs that they’ve purchased. This is easy to do, but it does take a week longer than chicken eggs and the hens may become tired of doing the job. If that’s the case or you don’t have any chickens, you can always use a heat lamp and/or an incubator to help you hatch your eggs. The eggs should be stored in a cool place and should be turned daily. Draw an X on one end and an O on the other so you know which ones have been turned. Eggs can be stored for 7 to 10 days before they require incubation. Then place them in the incubator. You’ll have some problems at first figuring out which settings will work best for your eggs, so you may lose a few batches before you find out what works. Set at the recommended temperature with your first batch of eggs and then wait to see if hatching occurs. Always leave your incubator running for a day or two to ensure that there is an even distribution of temperature when you put your eggs in. It’s a good idea to create a heat sink in the incubator to help keep an even temperature throughout. You can do this by adding a few rocks or a plastic bottle filled with water. These will help to keep the temperature up when you’ve opened the door. You’ll also want to turn your eggs an odd number of times each day; many duck rearers choose to go with three. It’s best that you leave the eggs alone as much as possible, and soon you’ll hear and see the babies breaking through their shells. If you do notice that some ducks are having problems getting out of their shells, it doesn’t hurt to help them along in order to ensure that you get the most out of your hatching eggs. It’s required that you get some advice from an expert on how to do this, as doing it wrong can result in the death of your ducklings. Once the ducks have hatched, they should remain in the incubator for another twelve hours in order for them to fully dry off. This also maintains the humidity levels so that unhatched eggs may still thrive, and the other ducklings may even help those who still struggle to get out of their eggs. Outside of raising ducks and maintaining your flock, there are some essentials you need to be aware of in order to keep your ducks happy. First off is their housing. Because domestic ducks aren’t very good at flying, that means that they can’t get away from predators. That means that you’re going to create an area to keep these predators out. Many choose to use old wooden dog houses to serve as duck houses, which can save you on a lot of money, but it does require some work to convert them properly. The house needs to be elevated off of the ground, and there has to be enough head room so that there can be enough ventilation. Ducks release a lot of moisture from their feathers and through breathing, so they do need a lot of air flow. A layer of straw is all you need for bedding and nesting material, and you won’t need any special kind of heat in winter to keep them warm. Ducks are pretty hardy when it comes to the colder temperatures. The straw should be changed on a regular basis, but should be removed entirely if its wet or there’s an ammonia smell. In addition to the house, wire fencing around it can be used to keep out predators. It should be 1″ or smaller, and should be sunk into the ground at least 8″ to keep out digging. It would be a good idea for the top to be covered as well, as foxes and other predators can scale fences quite easily. Whatever water source you provide for them should also be cleaned and refilled on a daily basis. Ducks tend to use their water sources to make it easier to get food down, as well as bathing in them to spread their natural oil across their feathers to keep them water proof. These containers should be cleaned on a regular basis in order to inhibit algae and bacteria growth. You can choose to purchase special pellets from feed stores, as long as brewer’s yeast is added to the mix. 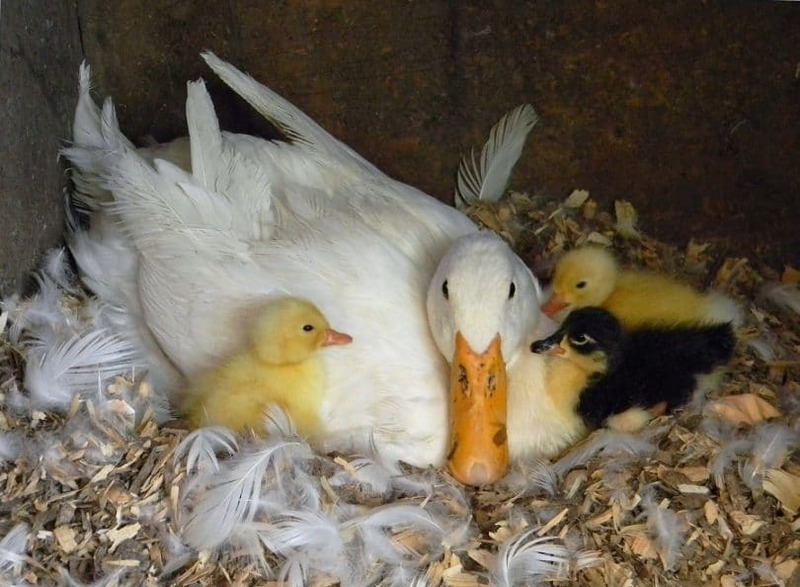 Ducks tend to grow very quickly, and brewer’s yeast helps their bones to grow correctly. he feed should be placed in wide tubs or containers that can’t be tipped over. An adult duck can eat about 4 to 6 ounces of feed per day, but this changes depending on the season. 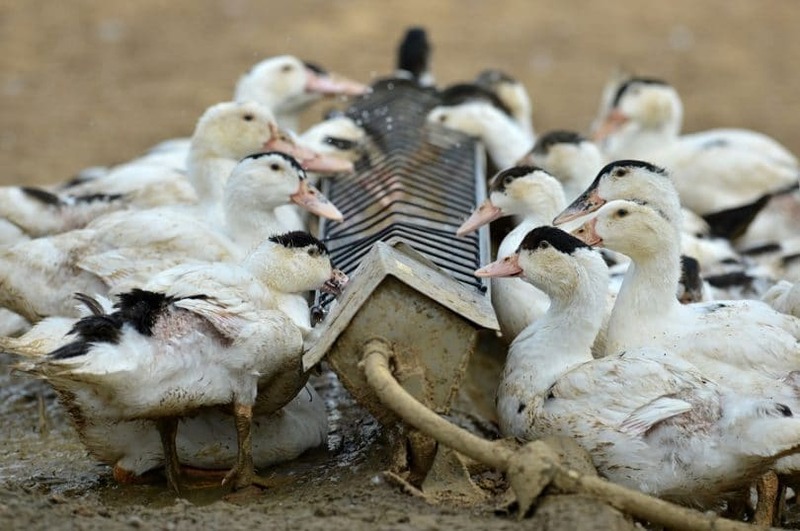 If any of the feed has gotten wet during the day, it’s best to simply discard it, as this promotes growth of bacteria and you don’t want your ducks to get sick. 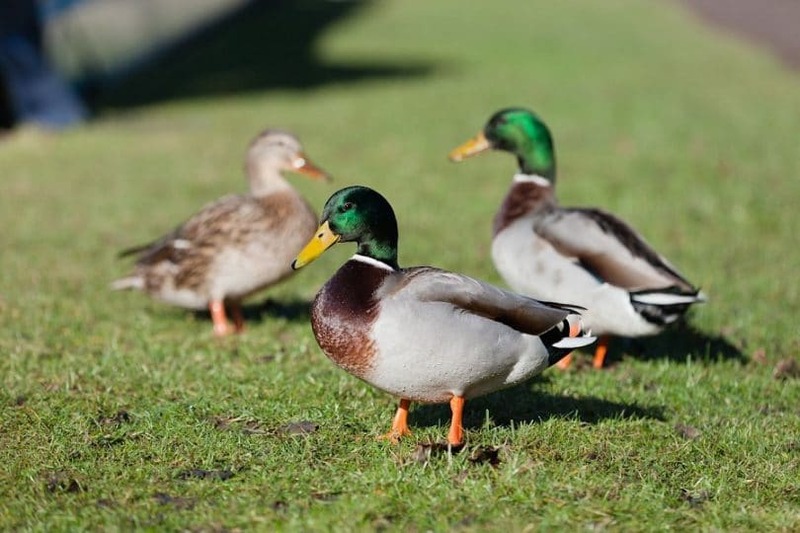 You’ll also want to include some leafy greens to your ducks’ diet. Cut weeds, lettuce, Swiss chard, cucumber, peas and corn kernels all make excellent treats for ducks. They won’t eat them if they’re wilted, so tossing them into their water not only keeps them fresh, but it’s also fun to watch the ducks dive down to catch their meals. Some coarse sand or dirt should also be provided to help your ducks digest their food in their gizzards. Ducks are known for being generally hardy animals that don’t require annual vaccinations or shots. They’re also not at much risk for contracting intestinal worms or external parasites, as the time they spend in the water helps to keep these off their skin. They are, however, prone to some diseases that require medical attention, and it pays to know what the signs for these conditions are so that your whole flock doesn’t contract them. Angel Wing: it is a non-life threatening condition where the wing doesn’t lay flat against the body. This can be the result of overfeeding of a high-protein diet that has cause the wing to grow too fast. This condition can be reverse by simply switching to a feed that has lower protein levels and providing plenty of exercise to your afflicted duck(s). Aspergillosis: these are caused by fungal spores and can cause heavy and laboured breathing. It can be treated by removing wet bedding and keeping the interior of the duck’s home well-ventilated. Bound Crop: long grasses and other objects can get stuck in a duck’s crop, causing the duck’s neck to look swollen and feel hard. You can massage the neck to get rid of it or add some vegetable oil to help break it up. Botulism: this bacterium thrives in pools of water containing decaying waste. Keeping water sources clean will prevent this from happening, as the onset of botulism can kill a duck within hours. Use vinegar and a scrub brush on water containers in order to keep them clean. Bumblefoot: this is an infection that starts with a black scab and swelling at the bottom of the foot. The infection can spread quickly if it’s not treated and can result in lameness. 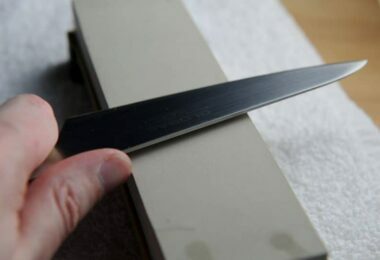 Watch the penned area for any sharp stones or branches that can cause a duck to cut its foot. 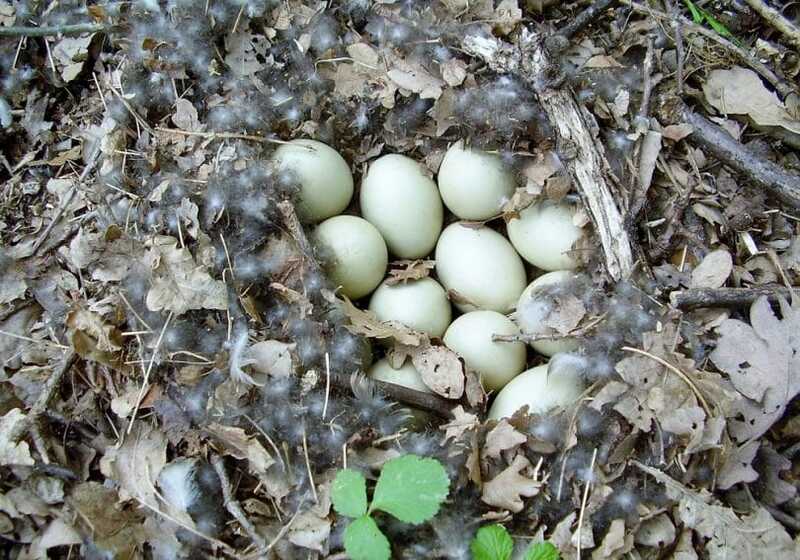 Egg Binding: this happens when a female duck is unable to pass an egg. You can help the duck by soaking the duck in a warm bath and applying some vegetable oil around the vent in order to make it easier for the egg to pass out. Eye Infections: this typically result from mating, as males grab females at the back of the head where the sinuses are located. These infections can also be the result of dirty straw or rice hull bedding, so it’s important to make sure these are kept clean as well. A rinse with saline water is enough to clear these up, as well as having access to a clean source of water. In the event that a more serious problem occurs, it’s important to keep the number of a farmyard vet on hand, or any vet that has experience in taking care of farm birds. You don’t want to prolong the suffering of your duck if it isn’t necessary, and the vet will definitely know more than you when it comes to more serious matters that you’re incapable of handling. Raising ducks can be a wonderful experience for everyone involved, and the ducks will come to appreciate your presence in their lives. Being patient and careful around your ducks will ensure that they will live happy lives, whether you choose to eat them or simply use them for their eggs. They’re a great way to be more self-sufficient if you’re looking to save money at the grocery store. Just keep in mind that that money will go towards keeping your ducks fed as well as taking care of any conditions that may arise in the future. Check out other ways on how to live off the land, do read our interesting article.